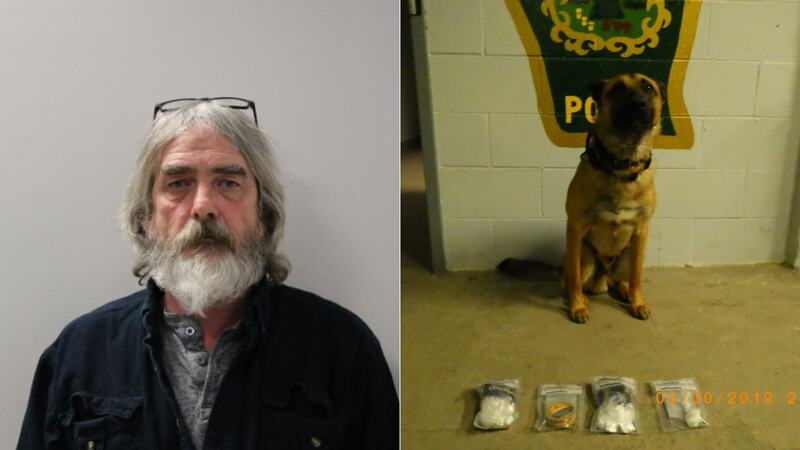 NEWPORT — An investigation by police in Newport has resulted in the arrest of a suspected drug dealer and the seizure of about 3 ounces of cocaine. Glenn Porter, 54, of Lunenburg was arrested following the investigation. Police say back in February they began receiving anonymous tips that a man was selling cocaine and unknown “pills” at the American Legion on Veterans Avenue, which borders the property of North Country Union High School. On March 1, Police Sgt. Charles Moulton was observing the area of the American Legion when another anonymous tip was provided that the person of interest was operating a GMC pickup truck. Moulton made note of a dark grey GMC Canyon in the parking lot. Police say they received numerous additional tips in March about a man driving a GMC Canyon, selling cocaine during the evenings. The investigation culminated on Friday, March 29, when intelligence gathered by investigators indicated that the suspect would be in the area that night, selling cocaine. Officers made a traffic stop of the suspect’s vehicle. After an on-scene investigation, which included the use of Officer Joshua Lillis and K-9 Ozzy, it was determined that drugs were likely in the vehicle. During the on-scene investigation, K-9 Ozzy “alerted” on the truck several times indicating the presence of an illicit substance. The suspect’s truck and clothing were seized and later searched after police obtained a warrant. Police say they found nearly 3 ounces of a white powdery substance, cash, and two iPhones during their search of the truck and clothing. As a result of the investigation, Porter was arrested. He was charged with possession of cocaine, attempted sale of cocaine, and conspiracy to sell cocaine. He was arraigned at Orleans County Superior Court yesterday. “I commend the officers for their hard work, as well as our citizens who came forward anonymously to report this activity,” Newport Police Chief Seth DiSanto said.